Dispersiones is a physical network comprising a series of interconnected relays that produce an artificial interactive soundscape. The work appears to be a messy web of hundreds of tangled wires through which sounds travel, following an algorithm of artificial life. Using only the metallic clicking sound of the relays, the network behaves as a complex system of electromagnetic actuators that interact with the viewer. Each individual relay acts as a "living" agent that activates the space and the architecture. Once the system detects a viewer's movement, it unleashes an infinite flow of sound and light. 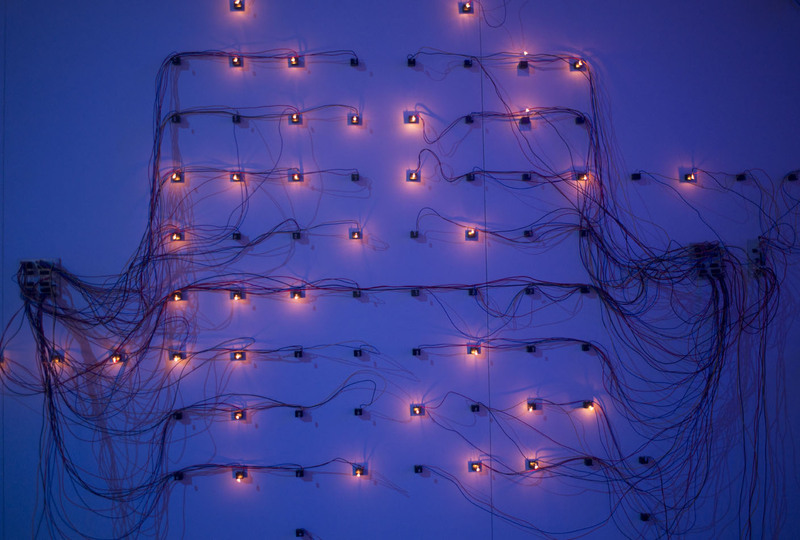 A network of clicking relays comes to life through sound and light.